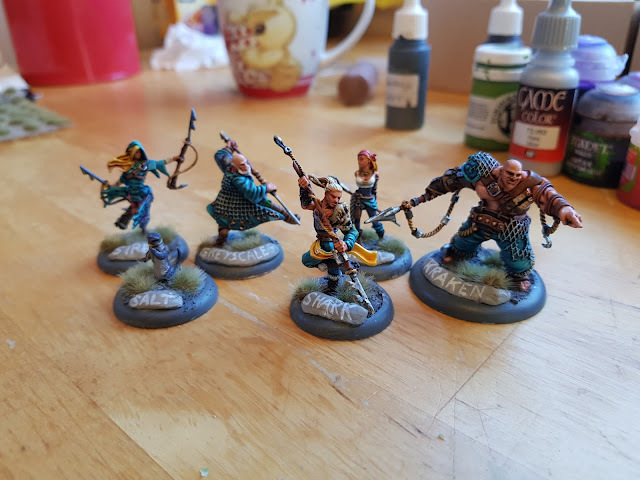 Lightning Shroud: Guild Ball: Fishermen "The Changing Tide" Box Fully Painted! Guild Ball: Fishermen "The Changing Tide" Box Fully Painted! My fourth Guild Ball team is ready to play! From the left: Siren, Salt, Greyscales, Shark, Angel, and Kraken. I went for a pretty classic paint scheme here, I think. P3 Arcane Blue base and light grey clothing, with some colorful details in yellow, green, red or pink on the models for some contrast. All the shading is various GW shades, with highlights picked out afterwards. I am particularly happy with what I did with Kraken's and Greyscale's fish netting. I painted it in the color of whatever would be beneath the netting, added shade, and then carefully drybrushed the netting light grey. It gives a subtle illusion that the netting has transparent holes.